While browsing this wonderful thing called the internet, charging up our creative juices, we’ve come across this brillant website full of ideas for Chalkboard Paint! And what a better way to spend a weekend than creating beautiful things!?! 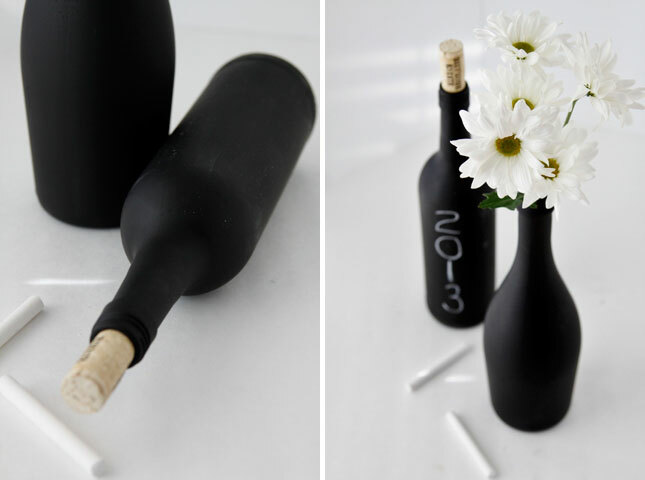 1) Chalkboard Painted Wine Bottles (via Bell’alimento) : I’m sure we’ve all got some extra wine bottles laying around the house, and if you’re not that much into wine or you don’t drink at all – just ask around and soon you’ll have your own small collection. Use Benjamin Moore Chalkboard Paint in order to create your own center pieces for a wedding, event, or simply your own personal home decorations. Add your own inspirational words or leave unmarked. Both provide for a unique and elegant decoration. 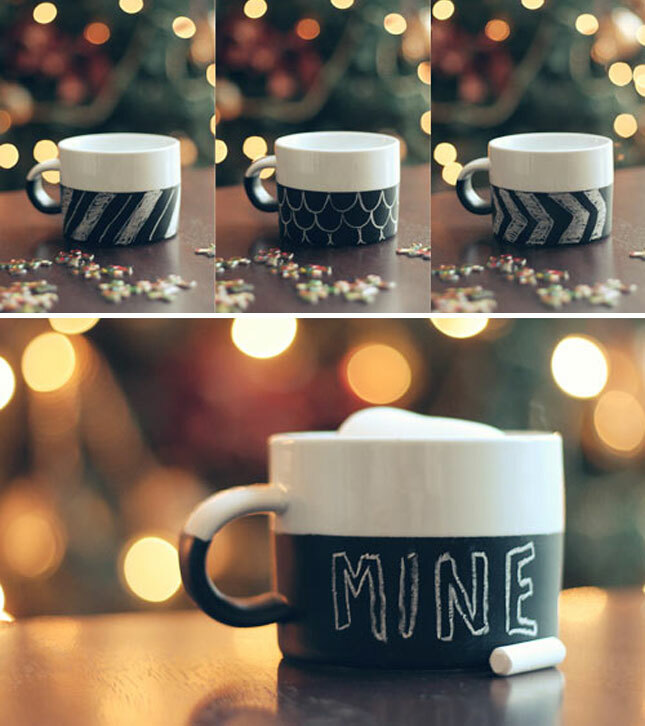 2) Chalkboard Painted Mugs (via Wit and Whistle) : Customize these mugs with chalkboard paint to give your drinks they’re ow personality! 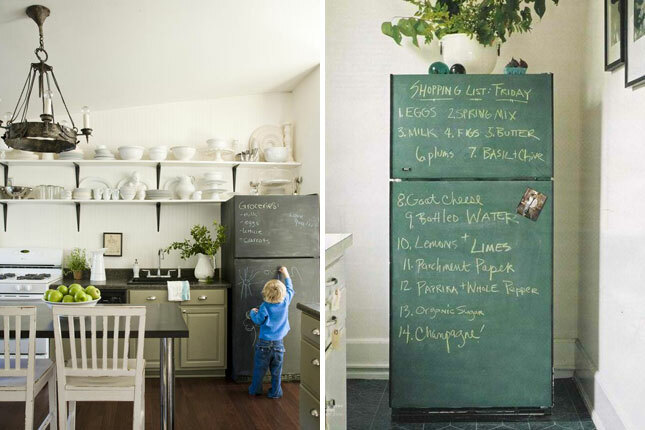 3) Chalkboard Painted Fridge (via HGTV + The Fancy) : Revamp that old fridge and give it some new life with a few layers of Chalkboard Paint. Make it a fun place for your kids to leave messages (or for you!) Good for list making, inspirations, or fun + creative drawings. 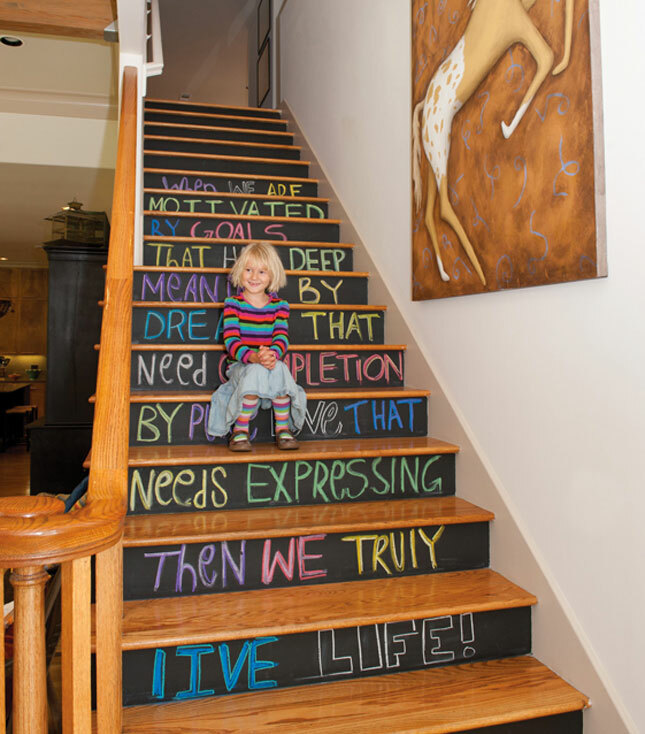 4) Chalkboard Stairs (via My Home Rocks) : Wait? Stairs you can draw on!? Yes, please. For a little more inspiration as you hike those stairs every day, add your own wise words or drawings. For more amazing ideas, check out: Chalk It Up: 40 Creative Ways to Use Chalkboard Paint + don’t forget to stop into Exeter Paint for your own Benjamin Moore Chalk Paint! Don’t let another weekend slip away without making your own Chalkboard Paint project!